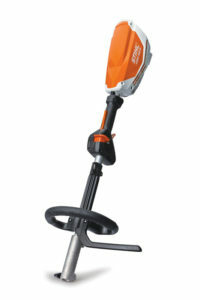 Stihl released the KMA 130 R KombiMotor, a tool from the company’s AP Series of battery products. It gives professionals the ability to trim, prune, edge, clean, cultivate and more without gas or exhaust emissions. The external battery source shifts the battery weight to the user’s back or hips, instant starts allow quick movement from one task to another and the variable speed throttle trigger has three performance levels, allowing the user to select the operation speed that’s best for the job at hand. Vertical hanging slot for convenient, easy storage. The powerhead only comes at an MSRP of $349.95. Batteries, chargers and accessories are sold separately.